Power connectors are used to connect large cables which use high currents. Power connectors are used a quick form of connecting and disconnecting cables safetly and quickly. There is no male or female connectors. 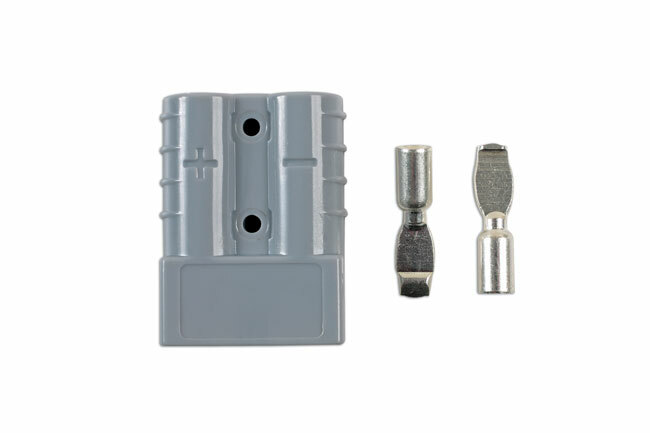 Two connectors are used to create a connection, use the power connectors in reverse and click together. Used on commercial vehicles, jump leads forklifts, cars, caravans, boats, race cars etc. 3 types available, 50amp, 175amp (30087) & 350amp (30088). Suitable for cables up to 16mm². Comes complete with 2 terminals. Please use our Laser Tools Part No 6615 & 6922 to crimp terminal lugs on to cable. Utilisation recommendée des ref 6615 et 6922 pour le sertissage des cosses sur le câble.